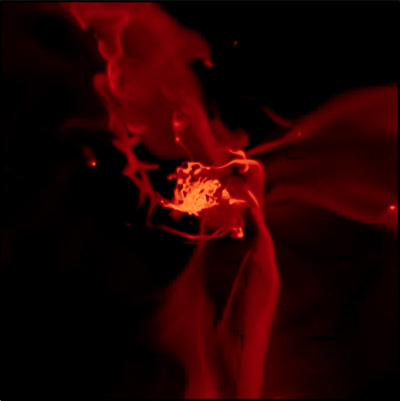 This image from a simulation of galaxy formation shows streams of gas feeding the growing galaxy. The newly discovered gas clouds may be part of a "cold flow" of gas similar to these streams. Image from simulation by Ceverino, Dekel, and Primack. For the first time, astronomers have found pristine clouds of the primordial gas that formed in the first few minutes after the Big Bang. The composition of the gas matches theoretical predictions, providing direct evidence in support of the modern cosmological explanation for the origins of elements in the universe. Only the lightest elements, mostly hydrogen and helium, were created in the Big Bang. Then a few hundred million years passed before clumps of this primordial gas condensed to form the first stars, where heavier elements were forged. Until now, astronomers have always detected "metals" (their term for all elements heavier than hydrogen and helium) wherever they have looked in the universe. "As hard as we've tried to find pristine material in the universe, we have failed until now. This is the first time we've observed pristine gas uncontaminated by heavier elements from stars," said J. Xavier Prochaska, professor of astronomy and astrophysics at the University of California, Santa Cruz. Prochaska is coauthor of a paper on the findings published online in Science on November 10. First author Michele Fumagalli is a UC Santa Cruz graduate student, and coauthor John O'Meara is at Saint Michael's College, Vermont. "The lack of metals tells us this gas is pristine," Fumagalli said. "It's quite exciting, because it's the first evidence that fully matches the composition of the primordial gas predicted by the Big Bang theory." The researchers discovered the two clouds of pristine gas by analyzing the light from distant quasars, using the HIRES spectrometer on the Keck I Telescope at the W. M. Keck Observatory in Hawaii. By spreading out the bright light from a quasar into a spectrum of different wavelengths, the researchers can see which wavelengths were absorbed by material in between the quasar and the telescope. "We can see absorption lines in the spectrum where the light was absorbed by the gas, and that allows us to measure the composition of the gas," Fumagalli said. Every element has a unique fingerprint that shows up as dark lines in the spectrum. In the spectra from the gas clouds, the researchers saw only hydrogen and its heavy isotope deuterium, Prochaska said. "We don't have any sensitivity to helium, but we would expect to see it if we did," he noted. "We do have excellent sensitivity for carbon, oxygen, and silicon, and these elements are completely absent." Prior to this discovery, the lowest measurements of metal abundance in the universe were about one-thousandth the "metallicity" of the sun. "People had thought there was a 'floor' to metallicity, that nothing could be less than one-thousandth the solar enrichment. That's because the metals produced in galaxies were so widely dispersed in the universe," Fumagalli said. "So this was unexpected. It challenges our ideas about how metals are dispersed from the stars that produce them." The researchers estimated a metallicity for the pristine gas of about one-ten-thousandth that of the sun. At the other extreme, stars and gas with the highest metallicities are almost ten times as enriched as the sun. "The metal abundance in different pockets of the universe covers a tremendous range," Prochaska said. "So these findings place new constraints on our understanding of how metals are distributed throughout the universe." Powerful telescopes see distant objects as they were far back in time, due to the time it takes light to travel across the universe. The spectrographic analysis of the pristine gas clouds places them in time at about 2 billion years after the Big Bang, or nearly 12 billion years ago. At that time, theoretical models predict that galaxies were growing by pulling in vast streams of cold gas, but these "cold flows" have never been seen. According to Fumagalli, the pristine gas clouds are potential candidates for these elusive cold flows. Further studies are needed, however, to see if the newly discovered gas clouds are associated with galaxies.